Amazing, forecast-defying weather provided the backdrop for another successful Craughwell 10 today with 700 entrants and just under 600 finishers. After one-man parades at the front in the last two years, the crowd were delighted to see things go to the wire this time with Barry Minnock or Rathfarnham WSAF and talented Clare warrior Michael Shannon swapping places throughout the 10 mile circuit. In the end Minnock did enough to lead and hold his lead down the home straight to win by 2 seconds in 52:36 to Shannon's 52:38. After he caught his breath, Minnock summed his race up as "an epic battle". Shannon was also delighted with his own run, and it was a good one with the recent Kinvarra half-marathon still in his legs. 3rd home overall and first Galway man was Matt Bidwell of GCH, who also picked up a Galway AAI title in the process. First lady home was again Pauline Curley who shaved 4 seconds off her own course record with a good finish of 58:55, completing a hat-trick of victories for her. One of the biggest cheers of the day came for 2nd placed lady, Jane-Ann Healy of Athenry AC, also taking first Galway lads position.. And it didn't come easy. Jane-Ann was in 4th place with a little over a mile to go, but pushed hard over the finishing stretch to pass two competitors including Fionuala Doherty of Clonliffe Harriers who finished in 3rd. The open team competition went to a mix of Clonliffe Harriers women and Rathfarnham men. Second place was a pickup team from the midlands. Third place went to a team from 2010 champions Mayo AC. Click read more to view all the AAI results. Thanks to Iain Shaw and facebook for the above image of the start line. Looking for a new year's target? In case you didn't spot it over on RunIreland or at the Athenry launch, the Craughwell 10 Mile road race is on this year on the 18th of March at 1:00PM. The poster is below, picture courtesy of John O'Connor. 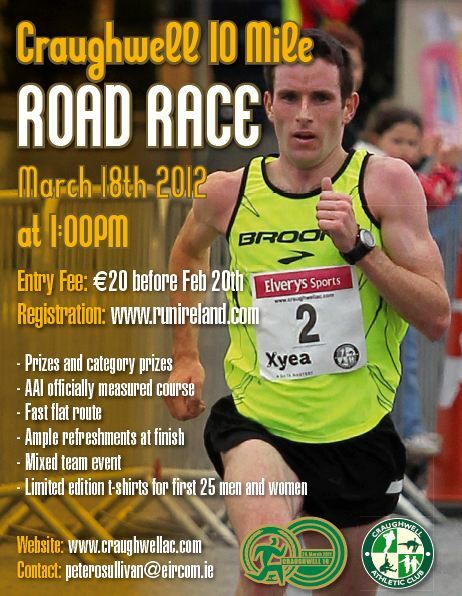 For the third time in a row, Irelands oldest sports store Elvery's have come in to help sponsor the race. (The sales in Elverys is well worth checking out by the way - I got two pairs of good asics for 90 euro on Monday). The course is identical to last year and once again we'll do our best to make it an enjoyable experience for all. In a year where we could have actually run a race ON the lake, we get to have another race around it. A few years ago, there were hardly any races around and they were all big events to look forward to. Nowdays there's a new race cropping up every weekend, and in some ways it's detracting from road racing in my eyes (just my own opinion) in that each race has less participants and less of a unique feel. There is no doubt that the best races are the Club ones. They have great value, quality, culture and prestige and an edge of history to them. They are also spaced well enough apart to base your running year around them. There is also the good feeling to know that you are supporting a great charity that is local community sport. Loughrea club race is the grandaddy of them all, having been in operation for many many years in various guises. It is by far the most prestigous of the Galway races by any measure - formally having been a BUPA Great Ireland run and having hosted athletes such as Sonia O'Sullivan and Paula Radcliffe. In fact, if you look at the record books you will see that Sonia's 1999 time is still the world record for 5 miles AND 8k - not too many races can boast that! They have continued to innovate and keep things fresh and anyone who ran their 10k route last year will agree that it's a superior course. The kids race has to be moentioned - it's one of the biggest kids races in the country! So set your sights on Loughrea for the 25th September - give your support to our near neighbors and enjoy a fantastic event in the process. For more details visist http://www.loughreaathleticclub.com/. See you there! The race is on to represent Ireland in 2012 Marathon. Congratulations! And the winners are...!